The news of Stephen Harper missing a photo-op at the G20 Summit in London last week became the leading international buzz story in the lull between the high level discussions among the leaders and the presentation of the final communique. Here’s the BBC‘s account, CBS News, The Wall Street Journal, to name a few. 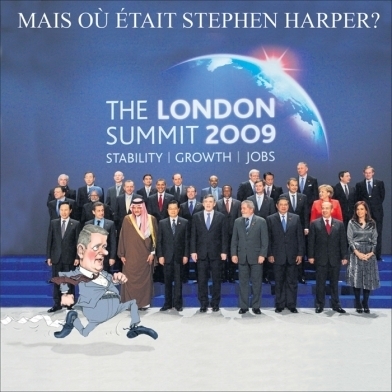 The Toronto Star wrote that the BBC’s economics editor, Stephanie Flanders, blogged about the incident and the “official explanation” that Harper was “in the bathroom.” Flanders jokingly added she suspected foul play “given Canada’s squeaky clean record” in the current financial crisis and that Harper would be forced to stand behind “the pot plant” for the re-take. In the U.S., the TV show Good Morning America said Harper had been in the bathroom and nobody noticed. Even the staid Wall Street Journal mentioned the incident on its economics blog. For a story that peaked in the midst of Thursday’s production time I was a bit taken aback that most English language editorial cartoonists in Canada didn’t bother to grab on to this story and draw something on it for Friday’s paper. 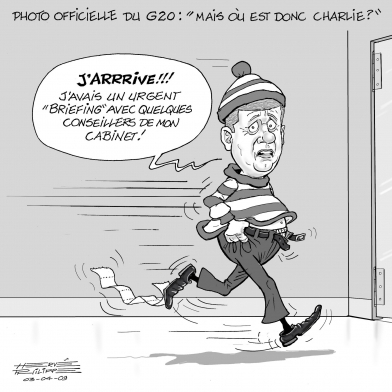 Three of Quebec’s editorial cartoonists thought the subject was worthy enough as shown here, here, and here. While it may not have been the most significant story of the G20 Summit, I think it all came down to the story simply having an incredibly short shelf life. In the fast paced cycle of 24 hour news the great shortcoming in the traditional print media is the reality that by the time you open this morning’s newspaper the rest of the world, online and on tv, has moved on. Commentary, in the form of opinion or satire might have some extra life in terms of time but it really rests with how the pack grabs on to a story and carries it along. As the traditional news industry grapples with a meltdown that’s seeing the downsizing of newsrooms and in worse cases bankruptcy of daily papers, Editorial Cartoonists are in a desperate situation of figuring out how to stay relevant. A big push in recent years has been toward online presence, in particular, with animated editorial cartoons. Many have tried, and few have continued. To work on something that takes days to animate goes counter to the fast pace and relevancy of the news cycle. Some cartoonists have taken the bold step of doing live cartooning. Posting satire on blogs as quickly as they can and being relevant all the while. Some examples are cartoonists who’ve been sent to political conventions or covered election nights. But as quickly as a media outlet employs someone to do that the fad becomes passe. So in the meantime, we cartoonists sit at our desks doing what we’ve always done waiting for our marching orders. I assume it’ll be the exit for some, and a new assignment for others. I don’t usually respond to things like this, but I must inform you that I found today’s cartoon in extreme bad taste! In such sensitive times as these, a little more respect should be afforded our leaders. Everyone seems to regard Barack Obama as a messiah, saviour if you will. However, he has already ” thickenend” the border between Canada & the U.S. & also gone on record stating that all North American cars should be made in the States, especially the mid-west. I think some light should be shed on matters such as these, instead of bashing our own leaders.